Projects. So many of them. Wedding. Band. Poetry. (Thinking about applying to) Masters Programs. New Music. Chocolate. Blog. Friendships. Do you ever find yourself swept up in a whirlwind of creative energy? I feel like I'm climbing a roller coaster. Like there's some great masterful expression about to burst out of me. I get this feeling of urgency in my chest, like someone's beating a drum on it. "Write, make, move, sing, stretch, feel the vision and make it known." Creativity is both a muse and a beast, lurking. Hiding in the corners of my house, waiting to show itself. It likes to wheedle its way into my body, burst out of my throat with words and music and strange laughter. And I let it. I'm not going to question the force that guides my tranced mind from one line to the next. I like to watch as thoughts pour out of me, barely made by me, like dreams I don't realize I'm creating. I (still) often think of Elizabeth Gilbert's talk on creativity, and how maddening it is. The genius (genie) lives around us, whispering at us. We have only to listen and express, relay the message and the music. But we have to show up, do the work, even when the muse is being fickle, hanging in silence in the walls. The muse likes to play, too. Mine particularly likes to catch me unawares, without a recorder, a camera, a notebook, a pen. And then that thread of a thought disappears as if it never existed. A cord of silk broken and pushing off into ether. Creativity is hitting me harder now (I think) because as I live my life and get to know what it is to be living, I come to discover the beauty of a breath, or a glance of sun, a stack of cast-off wood. I find myself entranced by a blood orange, as simple as that is. The tang and blossoming bite, oil and juice spraying. Pith clinging invisible to my palms, dug under my nails. I find life both tender and painful. Enrapturing and heavy. I stick close to work that pulls me out of the mundane and into the surreal and romantic. It lightens the burden of living. I KNOW I KNOW YOU CAME FOR THE RECIPE. Well, I mostly made this on my friends' wood stove. We hung out for hours cooking dinner and talking and lazily stirring this experiment dulce. It turned out damn fine, if you ask me. 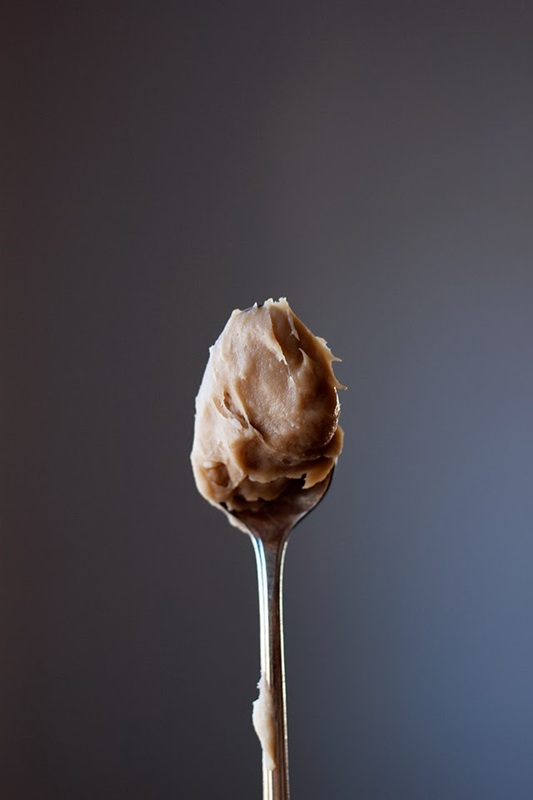 It's a thick, spreadable caramel with a strong coconut flavor (sorry coconut h8trs). I've dipped A LOT of foods in it so far, all rather delectable -- particularly some salty chocolate tortilla chips. I love dipping not sweet things into sweet things. As you can see in the photos, I sandwiched it between two sugar cookies. They're actually Lucy's cookies (which I happened to have around the house). Looking for a grain free cookie recipe? Check out my Maple Almond Cocoa Cookies (which, now that I think of it, would be AMAZING with dulce sandwiched in the middle!). MAKE IT. It's worth the lazy evening of caramel babysitting. your coconut milk in the refrigerator for an hour prior, so that the fat and water separate. In a medium pot, mix together coconut milk and sugar. Heat on medium high, until the coconut milk starts to boil. Lower heat to medium, and cook for 3 to 4 hours, stirring and scrapping the bottom and sides of the pan every once and a while. I stirred it every half hour or so at first -- when the mixture was reduced to 1/4 of it's original volume, I began stirring every 15 minutes or so. Once the dulce was reduced to 1/8 of it's original volume, I started babying it, stirring every five minutes or so, scraping down the sides, incorporating the caramelized bits. My dulce was cooking at about 300F to 325F most of the time. What to do if your dulce "breaks" i.e. the coconut oil separates from the milk: first off, if you get it down to the ultra-thick consistency of dairy-dulce, your dulce de coco will probably break. Don't freak out. You've just learned how coconut oil is extracted! The dulce "break" happened to me, and here's what you do: grab an emulsion blender or Vitamix (or other heat-safe blending apparatus) and whip it up (if using an emulsion blender, be sure the blending wand is fully submerged -- I transferred mine to a large canning jar). It will incorporate some air into the mixture and make the separated elements one once more. Cool it. Eat it. Spread it on stuff. Win at life.